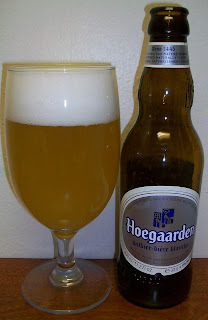 Hoegaarden is a very popular widely available Belgian Wit (white, wheat beer). This always seems to me to be the beer what Blue Moon in modeled after. It is pronounced Who-Gar-Den not the commonly used mispronunciation of Ho-Gar-Den. Sorry just a little pet peeve. I have had this a few times but I’ve never given it a full review. So lets see what Hoegaarden is make of. The beer pours a cloudy pale straw with yellowish hues and a bright white head. When I had just a couple of ounces left in the bottle I gave it a swirl and pour the sediment into the top of this beer. This sediment is not lees it is unfiltered wheat sediment should be poured back into the beer to be re-suspended. If you are only going to pour a small amount or drink this from the bottle you should gently turn the bottle upside down to re-suspend the wheat that settled in the bottom of the bottle. Nice yeasty and spicy nose. There are also some citrus and light flowering hop aromas. This is a very fresh clean smelling beer. There is a sweet wheat taste up front then a highly carbonated effervescence over your tongue. Just after that you have yeasty and spicy flavors on the backend. The finish and aftertaste is unmistakably Belgian. The yeasty aftertaste will give you a hint of that wonderful Belgian funk; slightly sour, sweet and yeasty. This bier just has a slight tease of that flavor. This bier also has some of those wonderful Belgian spicy flavors of coriander, and citrus. Once again these are subtle, just a tease to some of those bigger Belgian biers. You can tell that beer was designed to be an easy drinking bier or as the English would call it a Session Beer. That’s a beer that you can have several of in a session, like after work, and not get intoxicated. 4.9% ABV is a little high for a real English session but this does have that easy drinking aspect to it. That was so good I think I’ll have another as I work on my final thoughts. I have really enjoyed this beer. This is a good refreshing summer ale, for that matter anytime of year. It’s a good Belgian starter bier. I’m not really sure what to say about this bier. It’s an easy drinking all around good bier. But…to me this seems like it is brewed to be widely liked for mass consumption. It’s like a watered down version of a Belgian Wit. Well, that may not be fair; it’s a less hearty version? It is an authentic Belgian and it is far superior to most of the American versions. This is one of those style dilemma things I have in trying to rate this. As an authentic Belgian Wit is only a C. As an all around good drinking beer it’s probably a B.